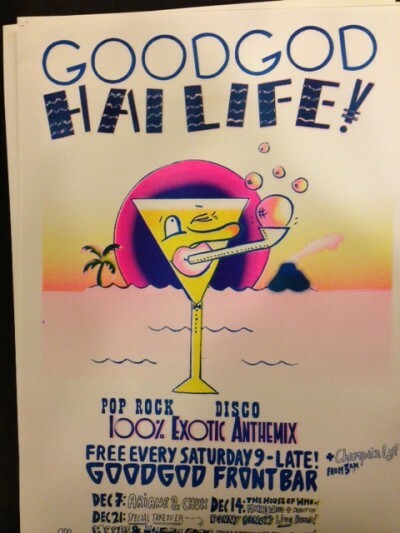 GOODGOD Small Club ~ THIS MONTH’S GOODGOD HAI LIFE POSTER! THIS MONTH’S GOODGOD HAI LIFE POSTER! If you’re a fan of the Goodgod Small Club’s aesthetic, be sure to get your copy of the latest limited edition Hai Life poster. They are super limited at only 100 made every month. This months poster comes hot off the press from a productive late session with the creative genius of Goodgod’s own Hana Shimada & the combined talents of Blood & Thunders Mark Drew, Harumi Takagi and Maria Smit. For a taste of some of Mark Drew’s amazing work check his Making Ends site here! The posters have edition numbers so are extra valuable if you collect every poster with the same edition number, be sure to get in quick. Ask for your poster with your edition number from the Goodgod front bar. There’s still a few left from last month if you missed out on the first poster in the edition. So get in and jump on board!